February 2017 – UNT faculty, staff, and students have been able to enjoy the thousands of instructional videos offered through UNT's LyndaCampus since it became available in September 2016. They also can enjoy it on the go with the Lynda.com iOS Mobile App made by Apple, Inc. Whether you are on a plane, train or beach in Hawaii, get access to the Lynda.com video library by signing in with your UNT credentials – EUID and password. 1. Download the Lynda.com app from the App Store. 2. Open up the Lynda.com app, and it will take you to a screen, such as the one shown below. From there, you’ll select the 'Already a Member' option. 3. Locate the ‘Organization’ tab on the login screen and select it. You will not be able to sign in through the 'Individual' tab. 4. Scroll down to the web login portal field of the 'Organization' tab. You must login through UNT System's web portal. 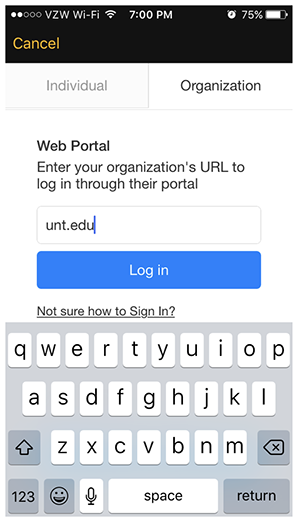 In the URL section, enter UNT’s main page URL, https://www.unt.edu/, which it will automatically recognize and direct you to UNT System's web login portal page. 5. Sign into the UNT System's portal with your EUID and password. Be sure that the screen you are logging into looks like the one pictured below. 6. Enjoy access to UNT's LyndaCampus from anywhere and learn on the go. In addition to learning on the go, you also can stream to your Chromecast, Google Cast-compatible device, or third-generation or newer Apple TV. For assistance with an information technology issue, please contact the Help Desk. Call, click or come in. Hours of operation are online.